VIII, 396 p., 3 ill., 13,8 x 21,0 cm. Arnold presents the first systematic study of the early biblical and exegetical writings from Schelling’s schooldays and years of study in Tübingen (1787–1795) and puts them in the context of the complex history of problems in the late Enlightenment. Apart from the general challenge of theology due to Kant’s reception, debates on basic principles regarding authenticity and and the Bible’s claim to divine authority had begun. Arnold shows that Schelling studied these controversies very closely and developed them into his own hermeneutic methodology. 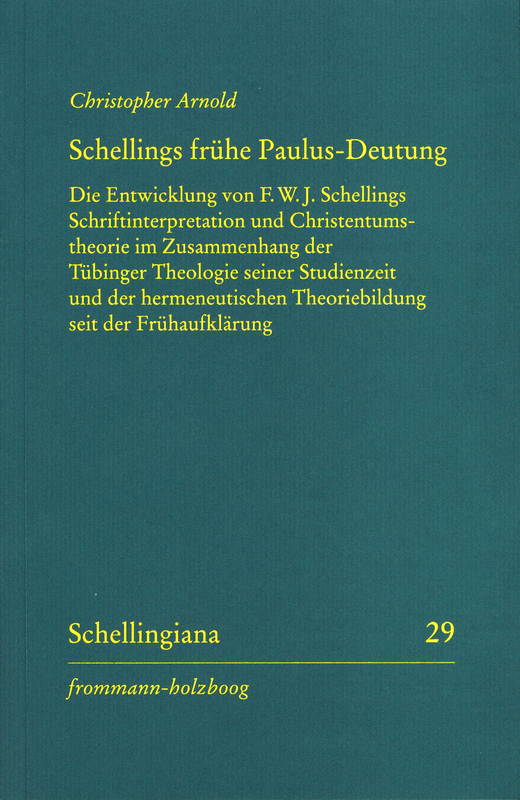 Schelling’s theory of interpreting the Scriptures, of the Christian religion and of the concept of faith, developed as a result of these studies, is also significant for understanding his later works on the history of philosophy and moral philosophy.